Every year, Americans throw away 50 billion food and drink cans, 27 billion glass bottles and jars, and 65 million plastic and metal jar and can covers. More than 30 percent of our waste is packaging materials. Where does it all go? Some 85 percent of our garbage is sent to a dump, or landfill, although we are quickly running out of space. 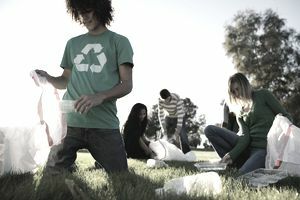 We've all heard of the 3 Rs of the environment: reduce, reuse, recycle, but do we practice what we preach? The 3 Rs — Reduce, Reuse, and Recycle — have been around for a while. Reduce. Purchase products that require less packaging or to limit the waste you are producing. Reuse. Use a travel mug or reusable water bottle and avoid single-use bags. Recycle. Paper, plastic, glass, magazines, electronics, and more can be processed into new products while using fewer natural resources and less energy. This is the 3 R’s mantra. Consumer product companies are always selling us a new bill of goods. The latest is that we can shop our way to a healthier planet. Over the years, they've also told us that cool cars would make us free and diet soda would make us popular. But there are some things money — and advertising — can't buy, and a clean environment is one of them. The hard fact is that global warming, deforestation, and other earthly ills cannot be solved by switching brands. It takes resources to manufacture and transport all products, even those made from recycled content. At the very least, energy is spent. And spending resources leaves the world poorer, not better off. So do what you will if you are itching for something new? Buying nothing is better for the earth than buying green. There are exceptions, of course. If your current car or appliance is a terrible energy waster, you may save resources in the long term by replacing it with an energy-efficient model. And it's better for your own health and your family's to replace products that could leach toxins, such as PVC baby toys. More often, though, it is greener to follow the old dictum: reduce, reuse, recycle. I know you've heard it a thousand times before, but with the "green" word now co-opted in the service of sales, the 3 Rs are a phrase - and a principle - worth reviving. "Reduce" means using fewer resources in the first place. This is the most effective of the three Rs and the place to begin. It is also the hardest because it requires letting go of some very American notions, including the bigger the better, new trumps old and convenience is next to godliness. But you don't need to let go completely or all at once. "Reduce" is a comparative word. It says: cut back from where you are now. When you shop, shop differently. Look for things that will last, things that are not just durable and well-made, but useful and beautiful enough to please you for a long time. The extra money you spend on their acquisition will be offset by the money you do not spend replacing them. Don't chase the latest fashions. They will age the fastest. With electronics, extravagance may pay. A super-charged computer will still run the software that comes out two years from now, and a large monitor will accommodate the ever wider web pages that companies will be building then. Similarly, a cell phone with a full-text keypad (or the iPhone) will see you through the text-messaging era that is upon us. When you make a purchase, find out how to keep the item in shape. Then, maintain it accordingly and repair it when necessary. Before you recycle or dispose of anything, consider whether it has life left in it. A jam jar can store leftovers. Food scraps can become compost. An old shirt can become a pajama top. An opened envelope can become a shopping list. A magazine can be shared. DVDs can be traded. A dishwasher can be repaired. A computer can be upgraded. A car can be resold. A cell phone can be donated. Returnable bottles can be, well...returned. Reusing keeps new resources from being used for a while longer, and old resources from entering the waste stream. It's as important as it is unglamorous. Think about how you can do it more. Recycling is the "R" that has caught on the best. Partly, this is because there are so many curbside recycling programs today, which makes recycling so easy. What keeps it from being a total piece of cake is the rules. Every municipality has its own, and they are not always as straightforward as they could be. For example, towns are usually particular about the plastics they accept for recycling. Most only take packaging made from #1 (PET or PETE) and #2 (HDPE) resins. You need to look at the bottom of the package for the chasing arrow symbol and check that the number is right. Some towns are even more restrictive. New York City, for instance, accepts #2 containers with necks, but not wide mouths because the two are formed differently and have different melting points. The wrong kind of plastic can "contaminate" the whole batch, rendering it garbage as far as the company with the recycling contract is concerned. So though it's a pain, try to learn what the recycling rules are in your own community and follow them whether they make obvious sense or not. It's the easiest way to do your part. As for shopping for green products, by all means, do. But when you really need the thing you're shopping for.